From the Facebook page of the SEIU Connecticut State Council. 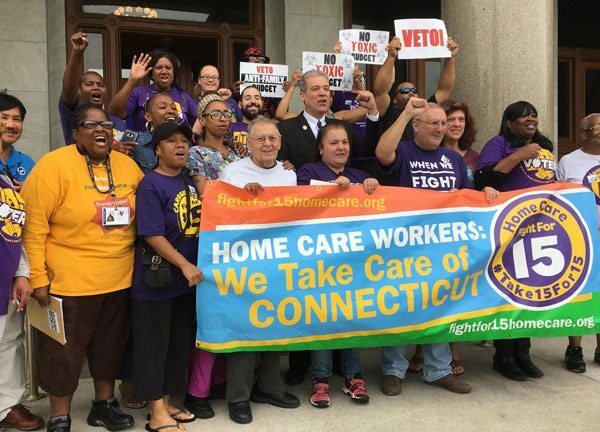 Even as news stories proliferated over the weekend on the crisis in the caregiver workforce serving people with disabilities, in Connecticut, 2,400 employees of nine nonprofit agencies voted to authorize a strike that will begin in the early morning of May 7th. Supporting the strike are not just the agencies employing the workers but also the state’s nonprofit alliance (join yours today). The workers are also represented by SEIU 1199. The intent is to get the legislature to increase their reimbursement rates, which have not been increased for more than a decade. They had originally been scheduled to strike on April 18th, but delayed the action at the request of Governor Dannel Malloy. However, the legislative session is drawing to a close and no deal has yet been reached. The legislature has clearly done some listening, as House Speaker Joe Aresimowicz (D-Berlin) said the Democratic budget included the increase in wages, but the final decision may end up in upcoming bipartisan budget negotiations. “We’ll work it out because we have to. This is [in] the must-haves,” says House Majority Leader Matt Ritter (D-Hartford). The proposal from Office of Policy and Management Secretary Ben Barnes would raise the wage for workers to $14.75 an hour and provide a five-percent raise for workers currently earning more than $14.75 an hour effective January 1, 2019. That’s something that SEIU would accept, so long as the legislature funds it. The wage increase would cost the state $45.6 million, but half of that would be reimbursed by Medicaid.